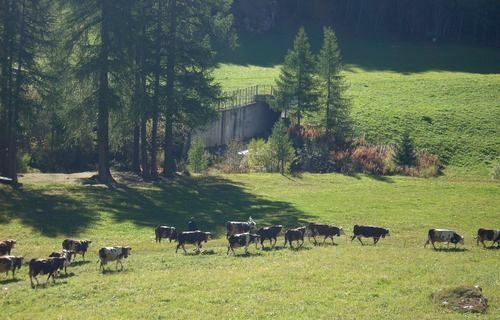 Maison Bovard : : : The "désarpa"
When the first cold weather arrives in autumn, the cows and their herdsmen have to leave their high summer pastures and go back to their lower valleys. Normally the day they return – called the «désarpa» or transhumance – is 29th of September, St. Michael, and it’s a feast day for everybody. Valgrisenche recalls this tradition, and you can see all the cows passing through the village, in particular the "reina di corne" (the best cow in combat) crowned with red bows and the "reina dou lacé" (the cow that produces the most milk) with white bows.